This morning I watched a film we had recorded in anticipation of my convalescence period. It was a good film, although I was a bit miffed to discover that I had correctly anticipated the plot before it had fully unfolded, including the twist and the kicker at the end. 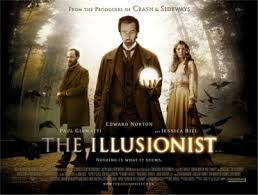 I still enjoyed the film (The Illusionist, with Edward Norton and Jessica Biel) but there was something disappointing about being able to guess the plot. It was not that I had seen or heard anything about the film, it just seemed to me that this was how the film had to develop, and I was right. One of the things that I find irritating is the practice of showing some of the best bits of a film or some of the plot in the trailers that are on the TV or in the cinema to try to get you to go to see that film. I understand that they want to whet people’s appetite and give them some idea of the genre of film, but why do they have to tell us so much or show some of the best bits of the film? It is almost impossible to avoid these trailers, which can spoil my enjoyment of the films. I have noticed that they do that for some TV programmes as well (but interestingly not for live football matches – they never tell us how they are going to end do they?). It is not for nothing that these are known as ‘spoilers’. I sometimes get the same feeling with the narrative of Christ’s life in the Bible. I know what happens, I know how it ends and I know about the plot twist and kicker at the end. One of the most difficult things I find (especially at Christmas and Easter) is finding fresh ways of engaging with the narrative. That is, until I sit back and relax, realising that I have been getting worried unnecessarily. I don’t have to rely solely on my intellect and imagination. Indeed that is a foolish thing for me to do. I also have the Spirit of Jesus who points out things I had not noticed before, or who shows me new ways of looking at the same thing. And that, I find, is really exciting. That is one of the reasons I keep going back to my Bible as often as I can, because the One who inspired it to be written is there inspiring me as I read it. I’m sure you can do better – go on, have a go! Next Next post: I say!